The more I know, the more I realize I don’t know. Such is the case with the two Iowa criminal cases I and others have been writing about on this website. Of course, I am referring to the 1995 Jodi Huisentruit disappearance and the 1983 Copper Dollar Ranch double homicide. In the process of investigating the Huisentruit case and writing Dead Air, I was pulled by circumstance and witness comments into probing more deeply into the older Copper Dollar Ranch story, a case with which I was not terribly familiar in the past. It’s not an exaggeration to call the joint investigations a labyrinth – these two separate cases in some ways became intertwined. I’ve often thought of it as being like a rabbit warren, a series of underground connecting tunnels in which one can very easily get lost! People can sure get lost in the rhetoric. Over the years, witnesses and others have shared some crazy statements with Gary Peterson and Josh Benson and me, and it’s very often hard to know what to believe. Some witnesses are serious about telling the truth, some are serious about lying. Some make offhand comments, and some share flawed thinking. Others blurt out the strangest things, and some willfully distort the truth, hoping to lead us astray. Some witness recollections and viewpoints simply change with the passage of time. Much comes from sources considered to be part of the public record, as flawed as that may be. As a result, we’ve been proven wrong more than once. Readers may take exception or disagree with what I write, and some have blasted me outright for writing something wrong. So I admit to having made mistakes, some of which I know about, many of which I don’t. No matter my personal perspective or opinion, I have always attempted to properly attribute comments. That’s the reporter in me, and it’s the least I can do. Some call me an “investigator,” and I guess I am, though I have no official credentials as such. That title makes me the “expert” in some people’s eyes, but simply writing about it on a regular basis is what makes others perceive me as the “expert.” It’s the nature of the beast. What I really am is a curious person, a reporter and writer at heart. I have a “nose for news,” like to ask questions, listen to the answers, and tell the story. By the way, on our team at FindJodi, Gary Peterson is the real deal (as a medico-legal death investigator), and he’s got the credentials to prove it. Josh Benson has got the news reporting and technical angles covered; Caroline Lowe has an investigative reporting and a police background. Jay Alberio was and is a cop, and Tara Manis is a research and fact-finding whiz. By default, Josh and I tend to do a lot of the writing. After years on television and in front of an audience, I have learned that it’s impossible to please one hundred percent of the people one hundred percent of the time. So, if you’re a fan, thank you. But even if you’re not a fan, and even if you disagree, thank you for your readership and for your comments. The majority of our readers think it is important to keep the channels of communication open on these two cases through the blog sites at findjodi.com and through my personal website. No matter what your personal opinion of me, as an investigator, a writer, or a speaker, I truly thank you for your input. 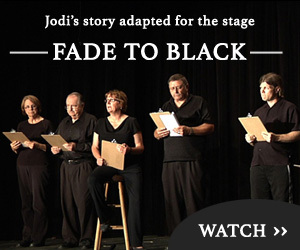 You and the Find Jodi team are doing a great job keeping the story alive. Just in the last week I’ve heard of two long term disappearance cases being solved, one because a family member spoke up and provided a vital clue to the location of the murder victims. I still have great hopes the same thing will happen with Jodi’s case and, if it does, your efforts will have made an important contribution. I don’t know what it is about the Jodi Huisentruit case that haunts me to this day. There has to be more than one person (besides the perpetrator) that knows what happened to Ms. Huisentruit — and why they have not come forward is more of a mystery. Can’t wait to read your book to gain a little more insight into this case. I’ll be purchasing it this week. I know this case has been such a terrible situation for everyone, Jodi had a great lifestyle-fun-TV career-friendly personality, wherever she is…I know that she is in the hands of God, prayers for her and her family daily. I would continue to reach out to person of interest: Tony D. Jackson, he has been the “key” to answering a lot of unknown questions, though he has a history of “not admitting” to his crimes-I feel he is doing this case the same way. God Bless You Jodi and Your Family Always. Me. Whatever happened about the Mason County police, and Ohl? Are people looking more seriously into that, or has it been discounted? Also has anyone other than the Mason city looked into why witnessed died? Or at the very least why people were listed as death by drug overdose when toxicology doesn’t warrant it? I’m still reading more here. I found this site via Disappearance on ID.